In the last year I have become a reformed Southern Baptist. I love my local church. I agree with most of it's doctrines and teachings. But the tension in my own life has not gone away as I still wrestle with questions on marriage and ministry and roles and submission. Sarah Bessey is one of my favorite bloggers. I don't agree with everything she says, but I love the way I see her heart in her words. And I am looking forward to reading her book this November to see if it eases any of the tension I feel on the topic of feminism and the Church. I struggle with the idea of labeling myself, but when I read her definition I found myself thinking, that is me. 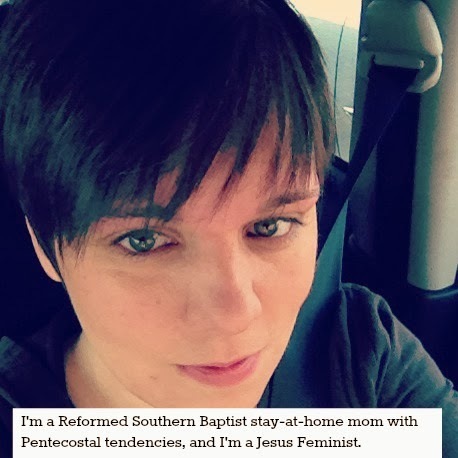 I am a Reformed Southern Baptist with Pentecostal tendencies. I am a stay-at-home mom who knows without a doubt that this is my calling for this season. I am the one who heard too many times the phrase "femi-nazi" on my dad's radio. I am the girl who vowed in the '90s to vote for Hillary Clinton someday, but who as an adult realized my political beliefs are pretty much polar opposite to Hillary's. I am tired of hearing I read too much into Galatians 3:28. I am weary of loud people - men or women - demanding things under the name of Christ - when Christ came as a humble servant never demanding anything. I respect my church's beliefs on women in ministry even if I do not personally agree with them. I choose to be a part of my local church because of so many other things I do agree with there and because of their heart for the Gospel. I believe in my friends who are called into ministry - who are gifted to preach and teach and serve - and who happen to be female. I am raising two boys to not believe men or women are better than each other - to believe that we are equal and that when we follow Christ it is not about us any more. I struggle with the belief some have that women can't lead in the church but they can lead in other places. I am scared to use the word feminist because of all of the negative things it conjurs up in my mind. I'm still learning after eight years what Christ wants for my marriage - and how that really doesn't have to be given a label one way or another. I am encouraged by my complementarian friends who are showing me it is not the stereotype I thought it was. I will always believe in the importance of having a parent stay-at-home with the kids, even if that opinion is unpopular and some of my closest friends disagree with it. I am learning that being a Jesus feminist doesn't have to be about politics or bad theology - it is feminism that is "shaped and informed by one's faith in Jesus Christ." I honestly admit that my views on this could (and probably will) continue to change in one way or another as I grow older and grow in my faith. I am Amanda, and I am (pretty sure) that I am a Jesus Feminist. Thanks, Brandee. The phrase "feminist" terrifies me really. The phrase Jesus Feminist terrifies me not as much. I think I just wanted to put this out there because I don't fit into labels or boxes - but I believe Sarah's definition leaves room for me and my values/beliefs. I have wrestled with this for a couple of decades now - and I don't expect that to stop any time soon. But I'm tired of feeling bad from "either side" (and from within my own little voice) for who I am, what I think, and why I think it. *Reformed* Southern Baptist is still an anomaly in my circles (although you and I are not geographically far apart), and I am one, too. My parents still don't believe me that there is a reformed resurgence in the Baptists, and they reject reformed theology wholeheartedly. It's good we don't fit neatly into all the categories that supposedly go together; just means we're using our brains instead of being herded like sheep. Yes - I really appreciated her simple (and room-y) definition. I also really liked Rachel Held Evans blog today on her complementarian questions. I don't agree with her very much (or read her very much any more) BUT I found myself saying, "That is exactly what I think/ask/want to know!" Love this, Amanda. And yes to the complexity and tensions here. There is no straw man, is there? So good. I love your openness to new ideas about God's love and work in the world! I've found that very few people are willing to let new perspectives challenge their preconceptions but I am grateful for this post and your spirit. Grace and Peace to you!